My boyfriend lives in Bishops Waltham and there are a lot of nice pubs in and around the area that we enjoy visiting. We recently went to two in the space of a couple of weeks so I thought I should feature them on the blog in case anyone is thinking of gracing them with their presence – they are both independent pubs and its difficult to find information about them online. First up is the Barleycorn Inn, right in the centre of Bishops Waltham village. 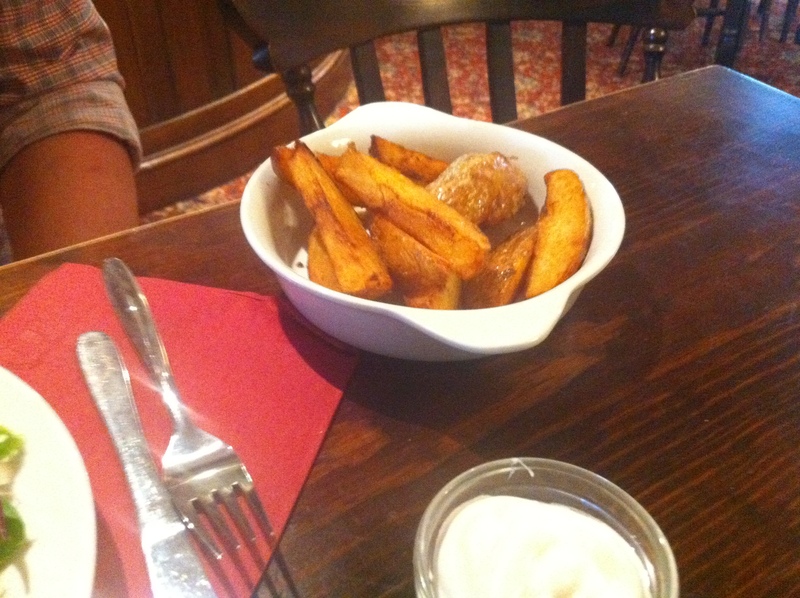 We’ve been coming to this pub for years and the food is terrific – delicious, huge portions and very reasonably priced. They change the menu all the time so you never really know what will be on offer until you arrive! This particular visit was a Friday lunchtime on a very rare weekday off for us – we’d been to Disneyland Paris all week and got back late the night before. After a lovely lie-in we sorted ourselves out and walked down to the Barleycorn for a well needed glass of wine (it was a very stressful return journey, we may have missed the Eurostar…) and some lunch. The pub was really quiet and although the weather was pleasant, it was still early March and we opted to sit inside the cosy, dimly lit restaurant area. We ordered drinks and then sat back to peruse the ever-changing menu with the help of the very friendly landlord who pointed out veggie options for Ben. 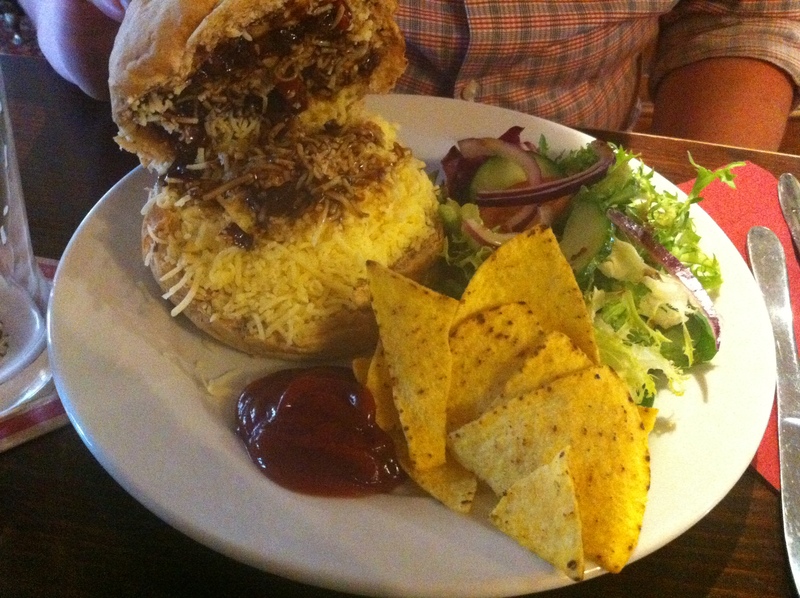 Ben opted for the vegetarian bean burger which he’s had before and loved, but unfortunately they were all out that day! It was no problem though and he quickly chose another meal, a cheese and pickle sandwich and chips. A boy of simple pleasures! However, there was a fair amount of other meat-free options – sandwiches, jacket potatoes etc and a couple on the specials board, had he changed his mind. I was tempted myself by the caramalised onion and brie tart but opted instead for one of my favourites, the bacon and cheese ‘Barley’ burger with crinkle cut fries. 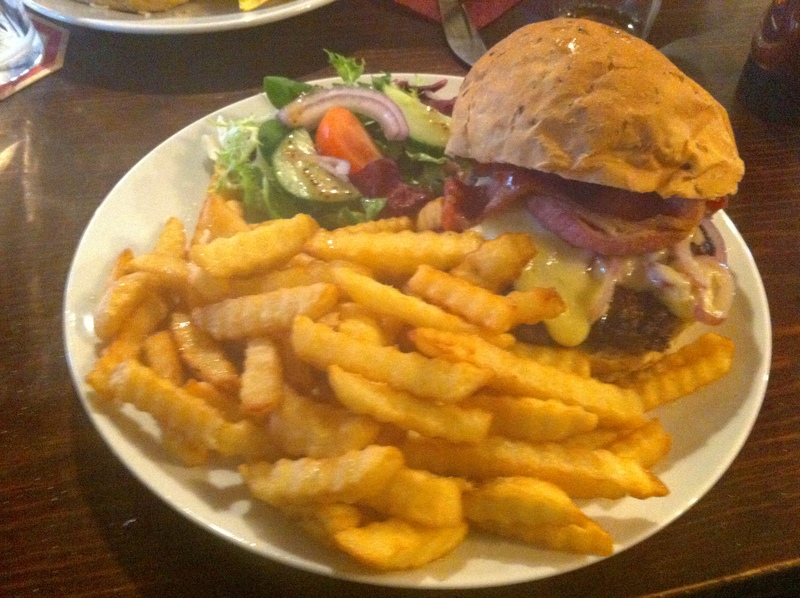 The burgers here are all homemade and freshly cooked and you can really taste the difference! 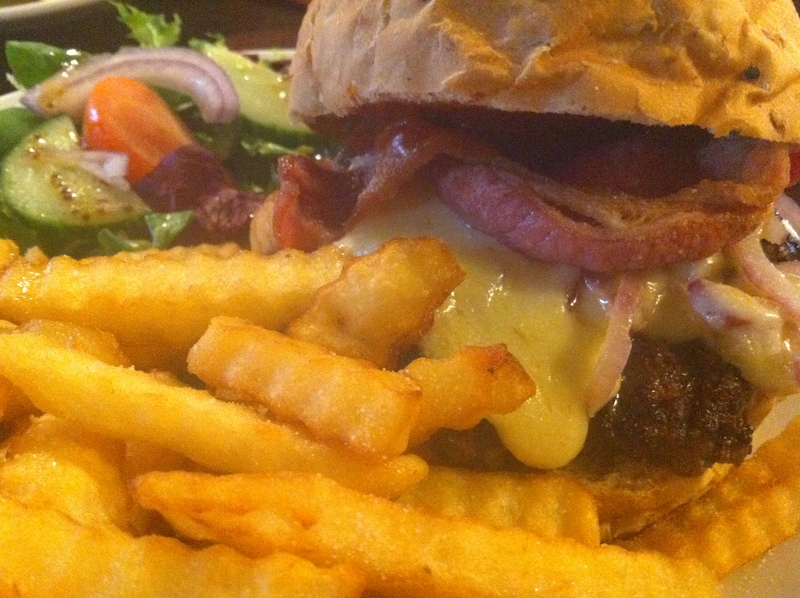 The bacon ‘Barley’ comes with a generous portion of crispy bacon, cheddar, onion rings, red onion and BBQ sauce piled on top, with a HUGE side of fries and salad. So much food! And all for the bargain price of £7.95! Ben was very pleased with his cheddar and pickle sandwich which again was VERY generous with the cheese! It came with a large side salad and tortilla chips and he also opted for the homemade chips – big, fat seasoned wedges, perfectly cooked. The Barleycorn has a wide selection of desserts that we are rarely man enough to sample due to the marvellously obscene portion sizes. The sticky toffee pudding though, is the best, a proper British stick-to-your-ribs dessert. We would really recommend the Barleycorn if you are visiting Bishops Waltham – it’s a lovely independent pub with great food and reasonable prices and, more importantly, a huge, fabulous beer garden! Perfect for sharing a jug of Pimms in on a hot (okay, warm) British summer day. Our next pub is the Robin Hood in Durley. It was a gorgeous freakishly warm March day and we decided to walk even though the pub is situated on a main road. Luckily the traffic was pretty quiet as it was a Sunday and we actually had a very pleasant walk. We arrived about 2.30 and were relived to see that they serve food all day on Sundays, as we had thought we may be too late for lunch. We peeked round into the garden to check if there was space and luckily there were a few free tables so we headed into the bar area to order drinks. Drinks weren’t overly cheap with a pound odd change from a tenner for a glass of rose and a Stowford press. We perused the two extensive specials boards which each had 10 or 12 mains and starters on, lovingly etched in colourful pastel chalk. I was quite taken with the idea of the butternut squash and sage risotto with blue cheese crouton, but it sounded rather heavy and dinner-like and I was forced to achnoledge that a. I was very unfortunately on a diet and b. this was only lunch. We grabbed our drinks and headed outside, asking a passing waitress to bring us a menu on the way. Perched on a wooden picnic table with a welcome umbrella shading us from the sun, we decided on our lunches, placed our order and relaxed while we waited. 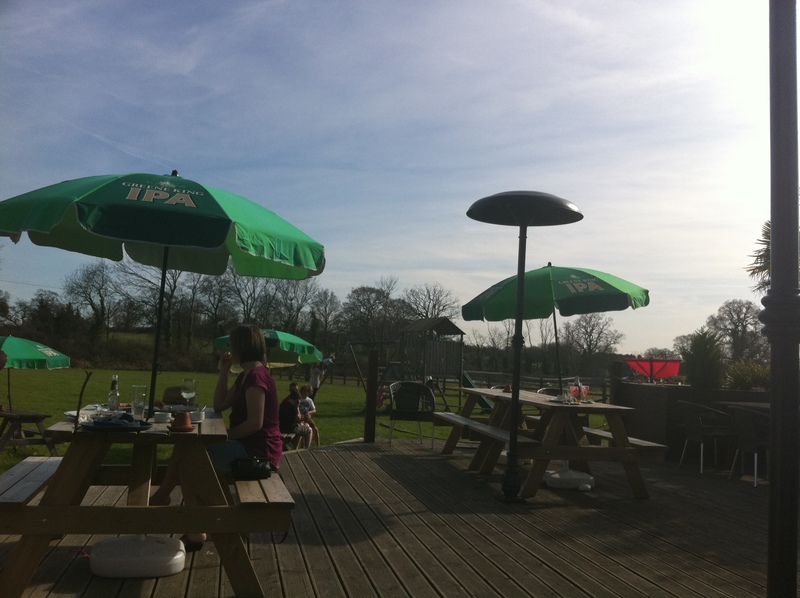 The Robin Hood does have a really lovely beer garden with a huge grassy field area at the back and a nice wooden decking area at the front. There are plenty of chairs and tables and we noticed that lots of people were coming in just for a drink, rather than lunch, thus vacating their tables quickly. Our food arrived within about 10 minutes which we thought was really good considering how busy they seemed. 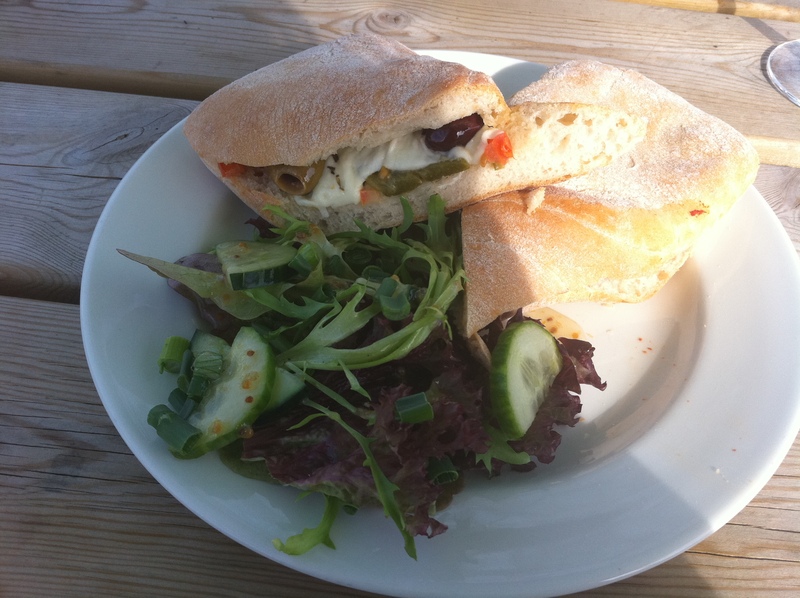 We both ordered the roasted red pepper, olive and mozzarella ciabatta. Now I have to say, I was slightly disappointed with the contents of the ciabatta. Sparse was the word. 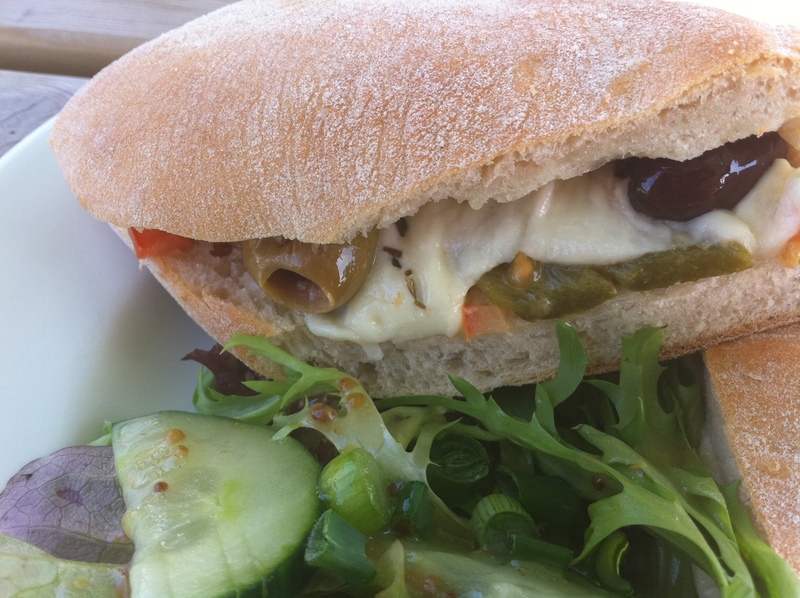 There were lots of lovely fat olives but only one strip of roasted pepper in each sandwich and a scant amount of mozz (although it looks adequately filled in the photo, all the topping was on the edges!) There was also no sauce or dressing or anything – I felt a good strong pesto would have carried the filling a lot further. It was enjoyable though and not unreasonable for the price (£5.95) with a lovely side salad dressed with honey and mustard. We were very restrained and managed not to order a side bowl of chips although we were relieved when we saw that the ‘chips’ were in fact thin, floppy McDonalds-style fries! Overall though, this is a lovely pub and the beer garden is the real star. Perhaps the quality of our food was down to the busyness of the pub – there was a 50th birthday party going on inside plus large groups of families all ordering lunch. I would like to go back one evening to sample the dinner options – my mind is still on that risotto! I’m surprised. Normally I’d choose the Robin Hood over the Barleycorn any time, but I have to agree those sandwiches do look sparse. I wouldn’t let this experience put you off trying one of their evening meals. They were indeed sparse on filling, such a shame!